Goldenseal is an herbal remedy made from the Hydrastis canadensis plant, which was first used for medicinal purposes by Native American tribes. Goldenseal is best known for its use in preventing or treating common colds and flu, but it may also offer some detoxification actions. However, goldenseal’s use as a detoxifier to clean your system of drugs prior to a drug screening is likely incorrect. Before you begin taking goldenseal for any health purpose, talk with your doctor about the correct dosage and potential dangers. Goldenseal owes much of its beneficial functions to the chemical compound called berberine, which appears to have antimicrobial actions, according to the University of Maryland Medical Center, or UMMC. The berberine in goldenseal can kill different types of bacteria, yeast, parasites and possibly other harmful microorganisms. In addition to berberine, goldenseal contains several other alkaloids like hydrastine, canadine, canadaline and beta-hydrastine, says the Memorial Sloan-Kettering Cancer Center. Goldenseal’s various constituents seem to offer anti-inflammatory, laxative and astringent effects that all may contribute to the remedy’s potential detoxification actions in the body. Goldenseal taken internally by mouth may act as an antibiotic and boost your immune system to help treat or prevent upper respiratory infections like colds, flu and allergies, according to the UMMC. Oral goldenseal might also help in treating infectious diarrhea, irritable bowel syndrome, urinary tract infections and indigestion, notes the University of Pittsburgh Medical Center. The herbal remedy could help treat heart arrhythmias, hypertension, high cholesterol and congestive heart failure. 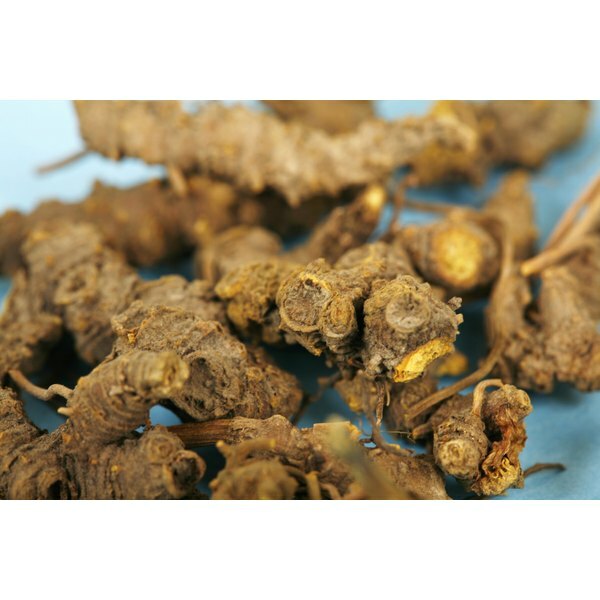 Applied topically or externally, goldenseal root may help treat fungal infections of the skin like athlete’s foot, vaginal yeast infections and infections of minor wounds. Other potential uses for oral or topical goldenseal include treating liver cirrhosis, anorexia, cancer, diabetes, conjunctivitis, fevers, menorrhagia, colitis and edema, says the Memorial Sloan-Kettering Cancer Center. No widely-accepted, conclusive medical research supports the use of goldenseal for any health purpose, however. Goldenseal became popular as a detoxifier for altering the results of drug tests, but this use of the herbal remedy is incorrect, says the UMMC. In fact, no scientific evidence has supporting the use of goldenseal as a detoxifying agent in preventing a positive drug test result. Aside from drug testing, goldenseal root may offer some detoxification effects in that its berberine content has the potential to cleanse your body of harmful fungi, bacteria, protozoa and other dangerous microorganisms, explains the University of Pittsburgh Medical Center. As a topical agent, goldenseal is used in the form of a cream, powder or ointment, says the University of Pittsburgh Medical Center. Taken by mouth, goldenseal is most commonly used in the form of a tincture or tea. You could alternatively take goldenseal root and rhizome in powder form in tablets or capsules, typically in a dosage of 4 to 6 g daily, notes the University of Michigan Health System. The liquid extract is taken at a dosage of 2 to 4 milliliters daily, while the standardized root extract is taken at a rate of 250 to 500 mg three times per day. Ask your physician about the correct dosage of goldenseal before taking the herbal remedy for detoxification or other purposes. When used in the proper amounts, goldenseal rarely causes any significant side effects, but it may cause some gastrointestinal irritation in certain people, says the Memorial Sloan-Kettering Cancer Center. Taking excessive amounts of goldenseal can cause constipation, stomach ulcers, nausea and vomiting, nervousness, depression, and even respiratory problems, convulsions, hallucinations or seizures. Goldenseal may be unsafe to take if you have high blood pressure or cardiovascular disease. Taking goldenseal during pregnancy could cause uterine contractions, increased bilirubin levels leading to jaundice and genetic damage, warns the University of Pittsburgh Medical Center. Goldenseal could also interact negatively with certain medications like cyclosporine, tetracycline antibiotics, blood-thinners like Coumadin and digoxin, cautions the UMMC.